For the next forty years Lutz would make his way in life as a professional artist. His work received local and national recognition and he was beginning to be noticed in Europe when he suffered a stroke and was forced to retire. He had numerous one-person exhibitions, received awards and was recognized as one of California's leading lights in the artistic community. 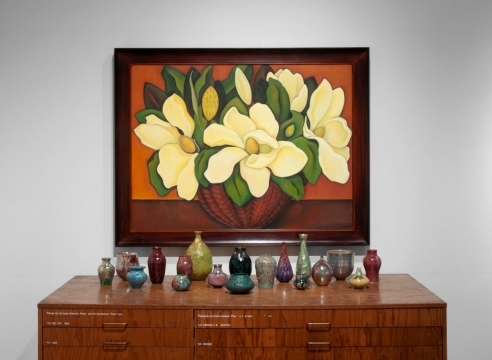 As the exclusive representative of the artist's estate Sullivan Goss is proud to offer works from every era of the artist's career in nearly all media: oil, acrylic, watercolor, and pen and ink. 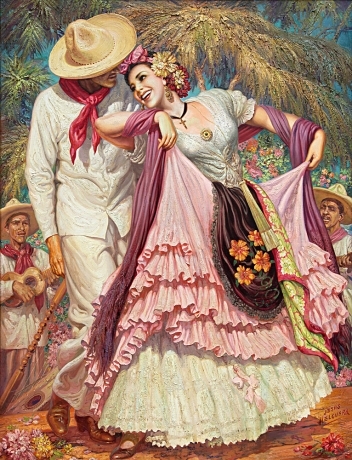 FOLK DANCES FAN THE FLAMES of romance, create the colors of culture, and carry on traditions – all of which are illuminated through Las Pinturas De La Fiesta, (The Paintings of Fiesta) now on exhibit at Sullivan Goss: An American Gallery during Fiesta and through August 31st. 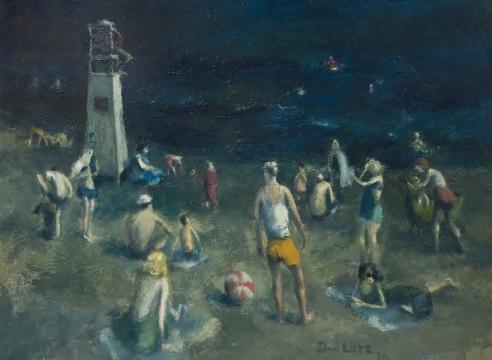 After graduating in 1932 Lutz turned to teaching to supplement his income as an artist. The country was still recovering from the Depression. 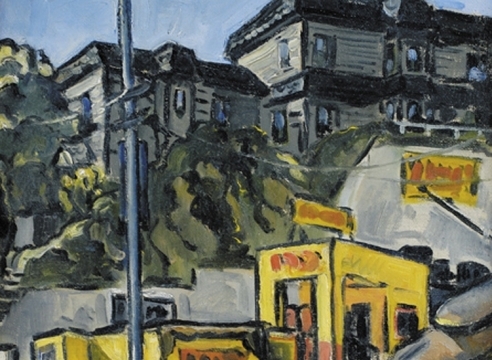 For nearly ten years he taught at USC and during World War II moved to teach at the cross-town rival for artistic talent, Chouinard Art School. While on the staff at Chouinard, he served as a visiting instructor at the AIC. 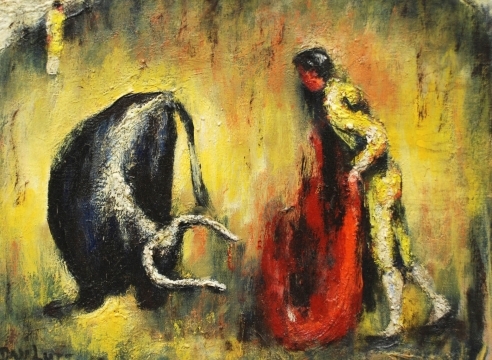 As an artist, Lutz was mercurial. 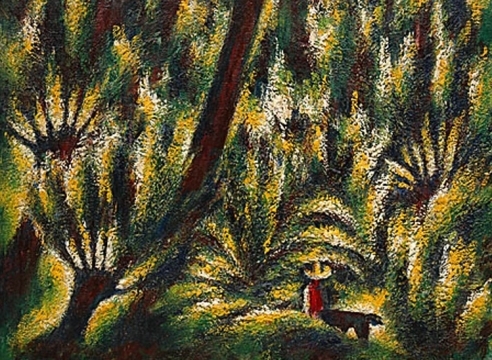 His development was so rapid during the 1930s that as soon as critics had developed a jargon for the work he was doing, they would find that his style had changed and their comments were no longer applicable. 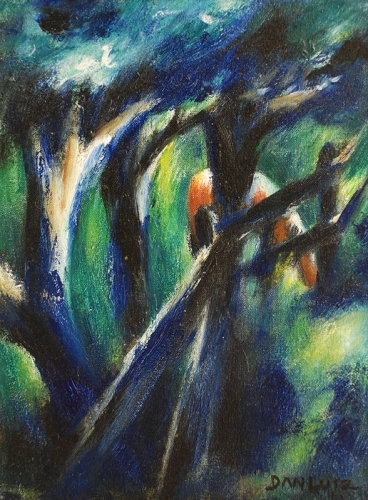 While working in watercolor in 1930s, he developed an individual technique using bright, opaque colors. 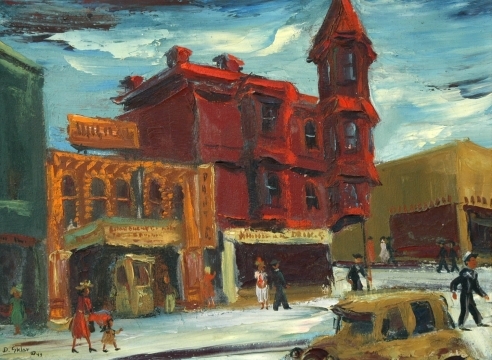 In the Scene Painting or Regionalist period in 1930s Los Angeles, his style separated him from his friends and associates, who included Rex Brandt, Milford Zornes, Phil Dyke, George Post, Paul Sample and Millard Sheets. Gordon McClelland and Jay Last in their book The California Style (1985) believe it was Lutz' early development of technique that "led to works different from those of any of his West Coast contemporaries." 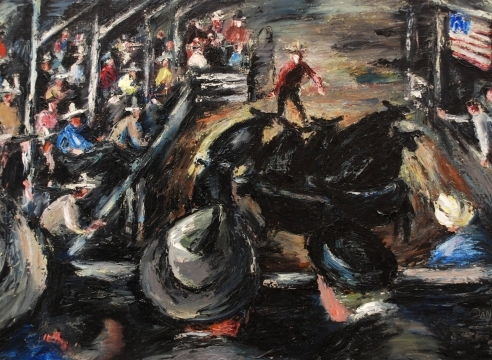 From the beginning of the 1940s until he had a stroke in 1971 was the artist's great period. 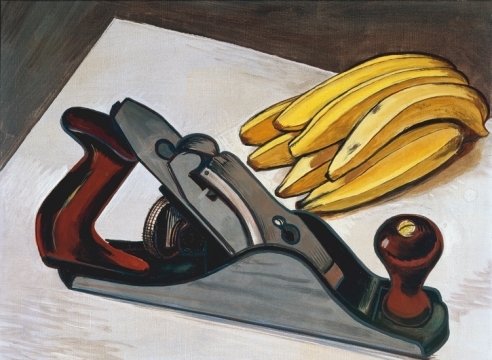 During this time his work became increasingly individualistic. 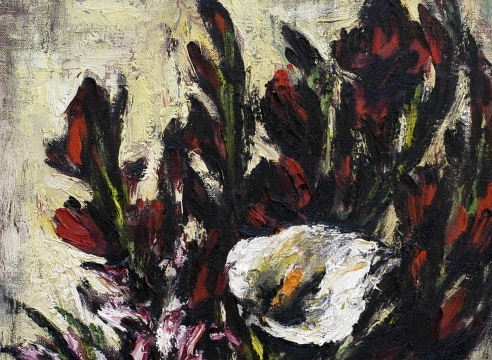 The artist's neice Annette Lutz Sutherland recalls that when he painted he had "a tremendous ability to concentrate to the exclusion of all other things." She commented that his paintings were "how he saw the world and he would paint whether the paintings would have financial merit or not." 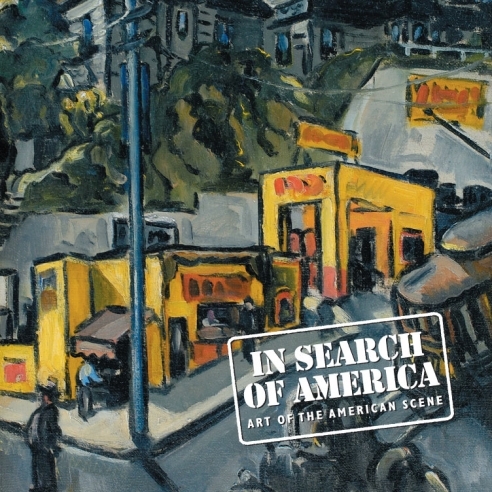 The artist's work of the 1930s is grounded in the American Scene Painting School and has some sympathy with the work of the great Social Realists, especially in the depiction of scenes portraying class struggle like Lutz's Wait'in For the St'eet Car, which was completed in 1941. 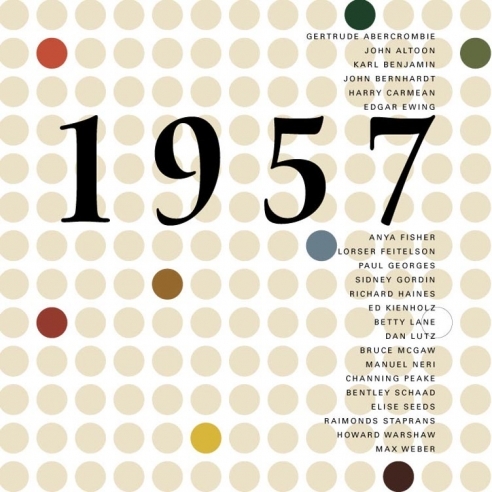 The 1940s saw a maturation of his style. 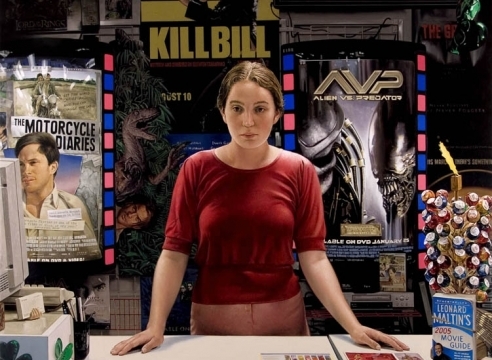 Now working in both oil and watercolor, the artist sought out scenes of day-to-day urban life. 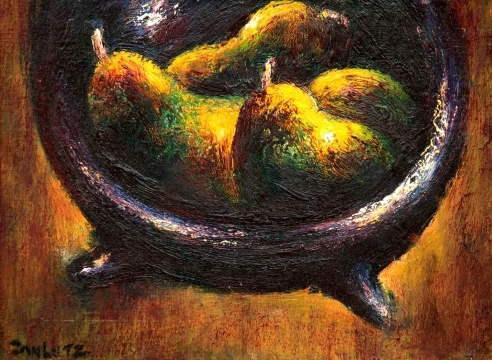 It was during this period that Lutz began his nearly twenty-five year experimentation with lithography. 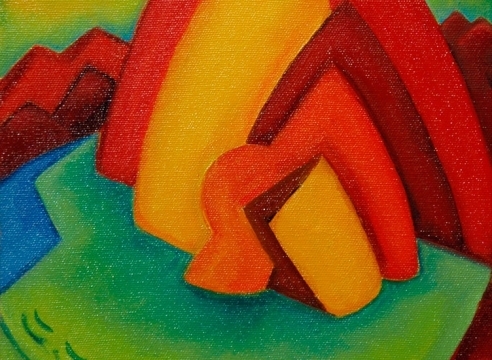 There is a distinct transition from the Scene Painting work of the 1930s to a reductive style with more limited topics. 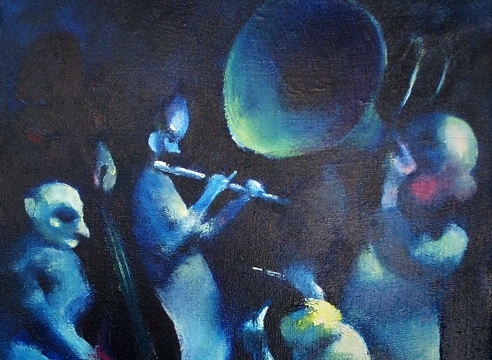 In the early 1940s Lutz was recording the lives of inner city Los Angelenos of African descent, depicting nightclub patrons, jazz muscians and men, women and children going about their daily lives. 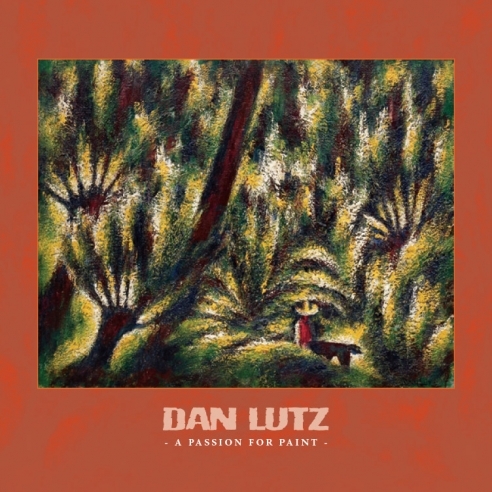 It was in the middle 1940s that Dan Lutz' paintings took on a more somber cast. The figures moved forward in his canvases until sometimes the painter was only dealing with the head and upper torso. During this darker period, darker perhaps in response to the tragedies of World War II, his figures became distended and sometimes freakish. Black was the dominant color. 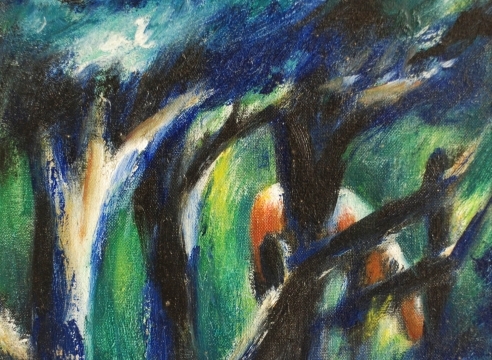 Relatives of the artist recall that this was a very troubled period for the artist and that at one point in 1945 he sought help for his difficulties, spending a short time in a sanitarium. Annette Sutherland recalls that after this period there were times when "he became withdrawn and would not talk to anyone." 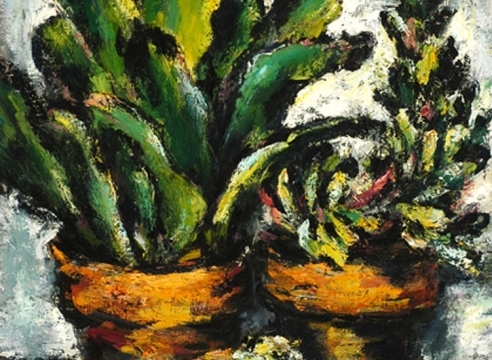 However, by the end of the 1940s Lutz' canvases broke away from featured paintings which used greens, yellows, browns and a sparing application of white. 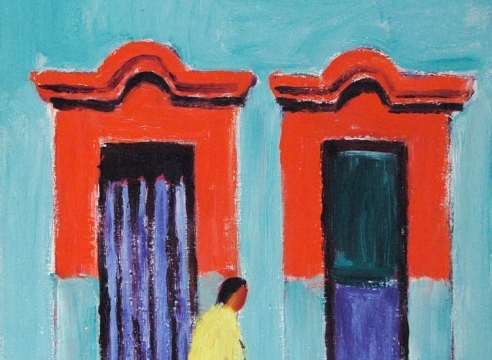 In this period Lutz continued to develop his focus on color. The pictorial content of his paintings diminished. 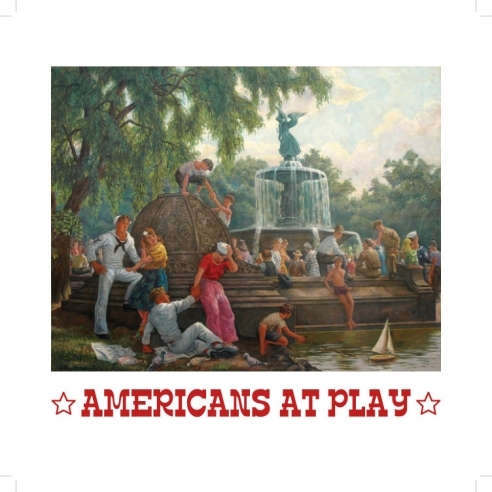 His canvases and watercolors from the 1950s contain less "storytelling" than his earlier work, and the social messages contained in his art of the 30s and 40s are no longer in evidence. During the 1950s the artist began to rely increasingly on contrasting intensified colors which are packed with an immediate emotional content. Representation is less important for the artist than rhythm and energy. Geometric form and human figures are still present in Lutz' work of this period, but their focus is softened. 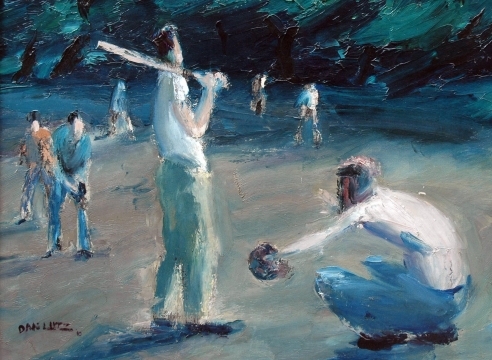 During the 1960s and on into the beginning 1970s the artist would sketch in watercolor in the plein air style. He would then convert the watercolor to an oil or acrylic on canvas. There was a time when the Mexican border guards would not allow Lutz to take his Mexican work out of Mexico. 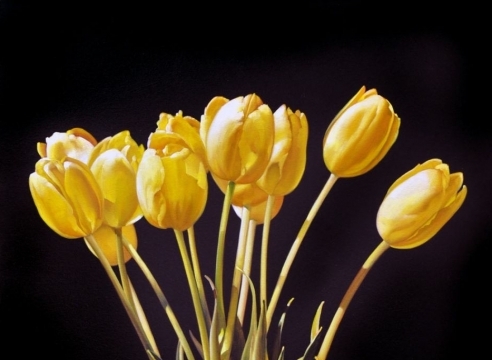 His solution was to photograph the topic and paint it when he returned to California. In the 1950s Lutz developed in two distinct directions. 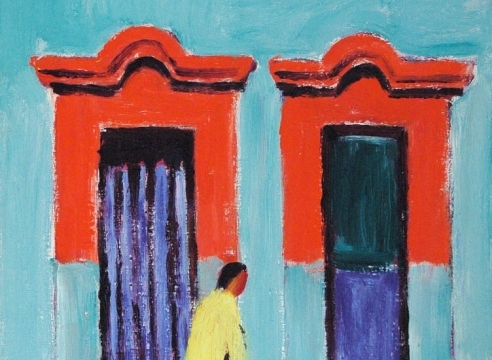 His trips to the midwest generated a body of work sometimes coined his "green paintings," but at the same time he made numerous trips to Mexico and produced a body of work in which he made use of the primary colors employed by Mexican village people at the time, colors which are coincidentally used in the Mexican flag. 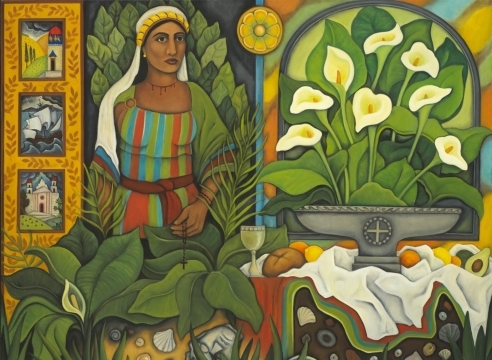 Where the Midwestern paintings are covered in a loosely woven and interlocking shapes, the Mexican works use a broad, planar geometry to express the organic feeling of old Mexican villages. 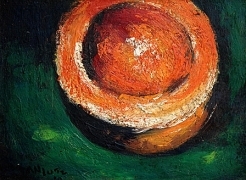 Although Lutz worked briefly in the 1970s, it was the 1960s sixties work that represents his most advanced development as an artist. 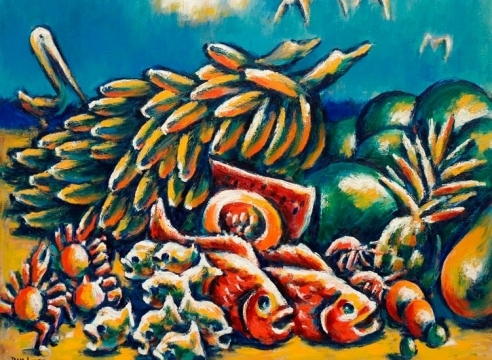 The imaginative, dream and spiritual elements of Lutz' style, all of which are present in work as early as 1940, evolved into the most powerful element of his art. Phillips Memorial Museum, Washington, D.C. 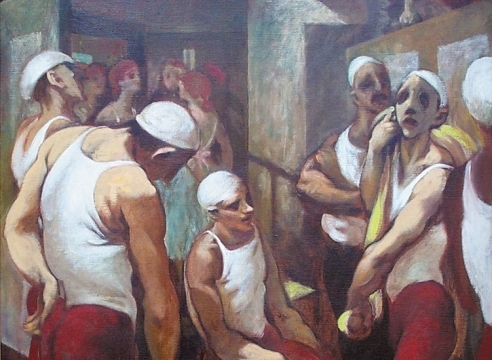 Throughout Lutz' artistic career was a series of themes which unfolded. 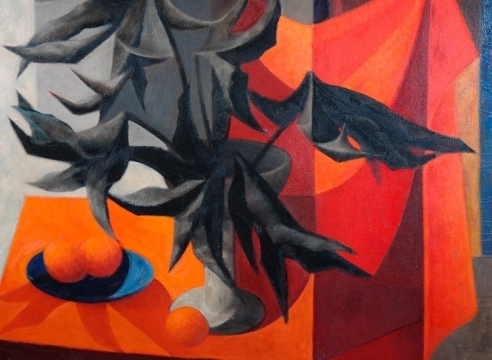 Some of these are defined by subject matter, in which cases the theme represents a brief period of the artist's career. 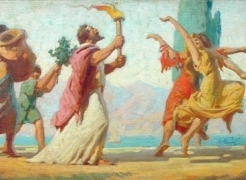 Other motifs are much more deeply imbedded in the artist's character and these leitmotiv recurr throughout much of the artist's career. 1931-1932 Traveling Fellowship, Studied with Andre L'Hote. to travel throughout the U.S., Mexico, Europe and New Zealand.